Dreams is essentially LittleBigPlanet on steroids, so of course you can make first-person games. As part of a stream hosted by Media Molecule earlier this week, the studio showed off a couple of prototypes that it’s been working on: a Mirror’s Edge-esque platformer and a traditional shooter – both from the first-person perspective. They’re understandably janky and they do very much appear to be experiments within the engine, but imagine what people are going to achieve when the developer puts this in the hands of the public. You can see the footage of the first-person games from about the 10:30 mark in the video embedded above. That call of duty article just became irrelevant. I am going to remake Farpoint without those b*stard spiders leaping at my noggin. That baturtle looks like Metaknight, which made me realize I can finally have Subspace Emissary 2 if SSBU other mode is only a boss rush. I wonder how mM will police this if people can make Mario64 or the never ever coming to HD Starfox Adventures? Nintendo hates stuff. Though I guess mM will be too busy policing genitalia, or worse, to care about copyright. I wonder if someone could make an entirely playable "A Clockwork Orange" game? Wouldn't even need dialog, just Bethoven and some ultra violence by a guy in white, you could basically do the whole movie as a 3rd person game. I think I just found a new hobby. Can we remake pong and space invaders in dreams? Wow, that’s insane. It’s also the first time I’ve seen less cartoony graphics, which has me even more interested. Wow, that was very impressive, particularly the FPS bit. As I’ve mentioned before on previous Dreams articles, I’m super keen to try my hand at making a horror game, as well as getting stuck into the music creator. I’m really hoping, and would imagine, that MM are developing Dreams’ tools to be as accessible as possible, making it almost idiot proof. 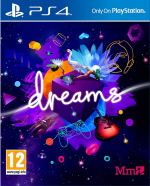 Because the more articles and videos I read and see, the more I’m starting to feel a bit overwhelmed by the apparent enormity of Dreams’ potential. Although saying that, like anything that’s a new experience, it can always be quite daunting at first, but through repetition and trial and error, I’m sure it’ll all become clear and make sense. Gonna create Black Ops 4 campaign with this. Pretty amazing. Really looking forward to the quality horror experiences that come from this, especially in VR!! !